Beekeeping is being used to help Welsh ex-servicemen cope with Post Traumatic Stress Disorder (PTSD). Carmarthenshire former soldier, Richard Jones, has teamed up with the Cywain Bee project as a means of helping his fellow ex-servicemen deal with the effects of PTSD. Himself a PTSD sufferer and beekeeper, Richard from Llanelli, believes there are qualities associated with beekeeping that can help veterans affected by the debilitating and distressing disorder that is triggered by traumatic events. Richard, who served in Bosnia, Kosovo, Afghanistan and Iraq, was diagnosed with PTSD a few years ago and his experiences put him in a unique position to help ex-servicemen, with tuition tailored to meet the veterans’ needs. 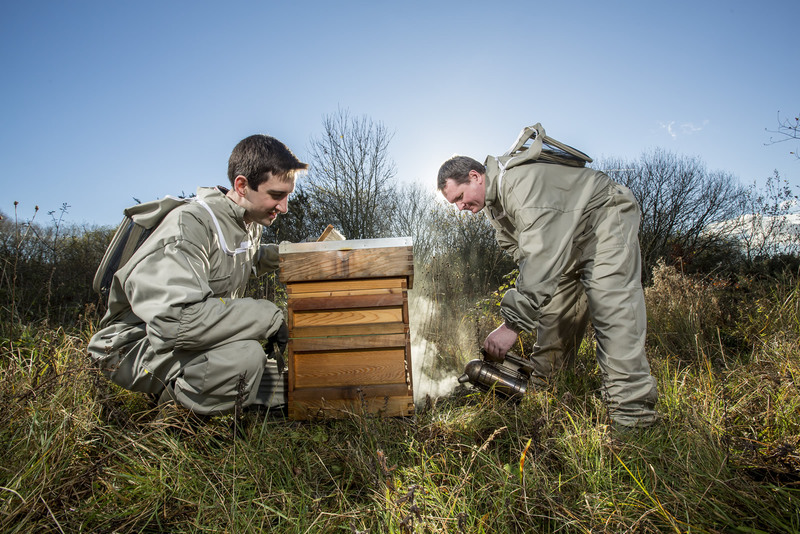 Beekeeping is an activity that can be carried out at an individual’s pace, and is therefore suitable for those who are affected by disorders such as PTSD. Richard is being supported by Cywain Bee – a project that encourages farmers and landowners to place beehives on their land and increase the production of Welsh honey. Says Richard, “One of the difficulties with PTSD is concentration, and short term memory loss is also quite common, as is difficulty with taking on board new information. Added to other factors, such as not wanting to socialise, joining a traditional beekeeping association may not be suitable for this target group. Those suffering from PTSD can often feel self-conscious – and can even be put off attending – when part of a regular tuition group, so Richard provides specific instruction, starting with opening up a hive. “What we offer here at the Bee Free Project is a complete understanding of the situation, having had these experiences myself. I can still experience difficult days and if anything these have added more humour to the lessons in typical military fashion,” he says. Fascinated by bees since a child, Richard runs Mêl Cilgwenyn at Cilgwenyn Bee Farm near Llangennech with his partner Rhodri Owen. 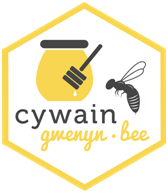 They have plans to further develop their Bee Free Project and will be taking part in a workshop in Newtown later this month run by Cywain Bee. The workshop on November 27th will show Welsh beekeepers how to get the most out of selling their honey direct to the public. Led by Total Food Marketing mentor, Russell Ferguson, the daylong workshop at Gregynog Hall will cover a range of selling techniques to help beekeepers generate sales and maximise their income from events such as Farmers Markets, Food Fairs as well as from the farm gate. Says Cywain Bee Development Manager Haf Wyn Hughes, “ We are delighted to be part of Richard’s initiative and see the difference it’s made to other ex-servicemen. “The specialist mentoring Richard has provided shows that while, due to special circumstances, not all individuals interested in the project feel comfortable joining beekeeping groups. Thanks to the link between Cywain Bee and Richard they can still become involved in beekeeping. Rhodri Owen (left) and Richard Jones of Cilgwenyn Bee Farm. Photo Caption: Rhodri Owen (left) and Richard Jones of Cilgwenyn Bee Farm. Cywain was set up by Menter a Busnes to bring added value to primary produce within the agriculture sector. The project has received funding through the Rural Development Plan for Wales 2007-2013, which is funded by the Welsh Assembly Government and the European Agricultural Fund for Rural Development.